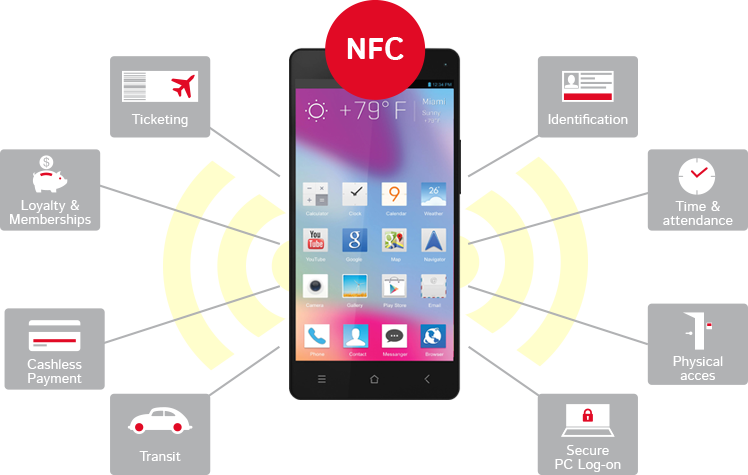 The NFC market is growing rapidly worldwide, due to expand of NFC smartphones and mobile devices. This technology offers the ultimate in security and allows implementing smart services like identification and access, authentication, e-payment, e-ticketing, filing sharing, etc. NFC technology employs electromagnetic induction between two loop antennas nearly located in two different devices with NFC functionality. PREMO has developed an innovative NFC product family (13.56MHz) very well suited for mobile devices like smartphones. These series cover not only single axis antennas (SDTR1103HF, ZC1003HF), but also 3D antennas with good performance regardless physical device orientation (3DC15HF, 2D1D). We also provide combined antennas with standard 3D low frequency transponder (125kHz) and NFC high frequency (13.56MHz) functionalities. PREMO NFC products can be used in applications with ISO15693 (vicinity: I-CODE), ISO 14443A&B (proximity: MIFARE) interface, ISO18092 and Felica. - NXP: MF-RC500, MF-RC530, MF-RC531, PN511, PN531, PN532 ¡, PN533, PN544, PN547.